ISBN: 9781532005121, $13.99, 176 pp. "Josy Rose is a young woman looking for a new direction in life, a new career. Her inner guide, Tariki, suggests that she become a cat burglar who steals only from the one-percenters to support animal shelters and sanctuaries, to be the Robina Hood for animal welfare. And having an element of irreducible rascality in her nature, Josy takes to the challenge. "Having watched Jo grow up for twenty-two years, Nick has felt like an invisible older brother. Now Josy's a young woman, and he's starting to have mixed feelings about her. When he joined the FBI, he made a list of rules for himself: No. 1 - No intimate relationships. "One summer solstice night in Jo's hot tub changed everything." A Fortune in Jewels is a fast paced, easy read about an important issue: animal welfare and animal rights. It's an eclectic mix of wit, romance, and adventure. Victoria Rose skillfully weaves factual information about white supremacists, petty theft laws, famous cat burglars, the Fund for the Animals, the Humane Society of the United States, the Center for Consumer Freedom, and the Cayman Islands throughout her third-person omniscient narration. Rose's main characters come to life through their thoughts, feelings, and dialogue--internal and external. 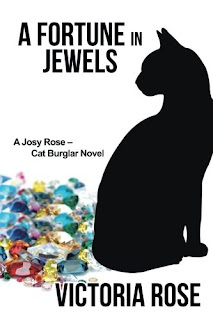 Josy Rose, the protagonist, is an unusual woman who takes on an unusual challenge. As an accomplished writer, Victoria Rose excels at imagination, description, and surprise, and even though the plot may seem simplistic, the underlying message is designed to draw our attention to and inform us about animal welfare/rights issues. Victoria Rose has published seven books: two nonfiction--Apple Cider Vinegar and Ladies Are You Lost? and five fiction--Into the Mystery of Life - Crystal Rose; Into the Mystery of Life - Pontella Rose; Into the Mystery of Life - Zorasteria Rose; Into the Mystery of Life - Tetralogy; and A Fortune in Jewels. I highly recommend A Fortune in Jewels for its quality, wit, and uniqueness.